I go supermarket almost every other day, to buy daily groceries and food as well as checking out information on any latest food or food-related products. 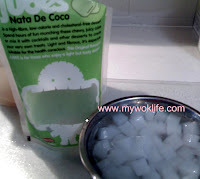 Nata de Coco – It might sound unfamiliar when first heard it, but you surely have tasted it before. In cafeteria, dessert store or elsewhere, just could not recall its name at times (smiling). It’s OK even if this is first time you heard about it. Nata de Coco was originated from Philippines. It is chewy, juicy and slightly translucent, jelly-like coconut water (which has been fermented) in tiny cubes. Nata de Coco is high in dietary fiber. One of the best food/ snack for dieting, health conscious people like you and me, as it contains zero fat and cholesterol as well as low in calories. And, it’s tasty! Even though Nata de Coco is often sweetened, but its calories count only 60kcal per serving of generous portion. Use this to impress your guests over the gathering in your house, too. It’s simple, you’ll have a glass of such fancy fruits dessert in no time! 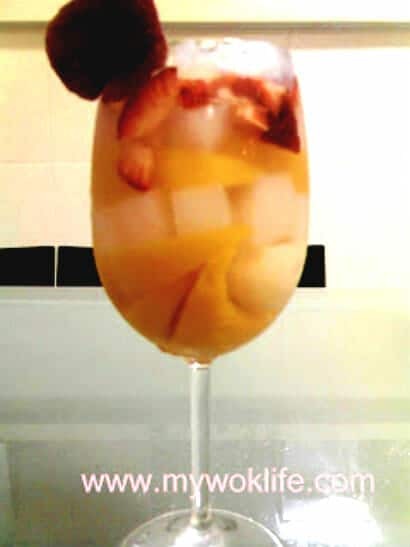 1) Get a clean glass, layer peaches, lychee, Nata de Coco and strawberry in the glass, in your desired order (I layered the fruits in contrasting colours manner). 2)Repeat the layering till three quarter-filled. 3) Add in the clear syrup. Serve chilled. My friends were pleasantly surprise when I served this after our dinner, and told me that she did not expect the Nata de Coco would be served in such a fanciful way. Tips: I chose these few fruits for their colours and the flavour of these fruits are compatible with each other, too. *Choose the original flavour of Nata de Coco to match with the taste of any fruit. * Use fresh fruits, if preferred. Just make your own honey syrup instead. * Just double the amount of ingredients if making more than 1 glass. Yum! Another quick treat for Nata de Coco is to mix it with a can of evaporated milk and crushed ice. Try it!